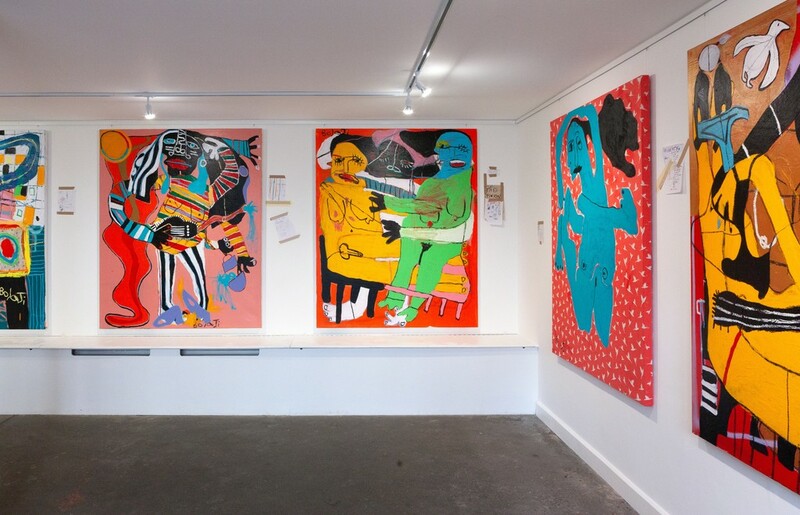 This exhibition presents a series of new work by London based artist Adebayo Bolaji. 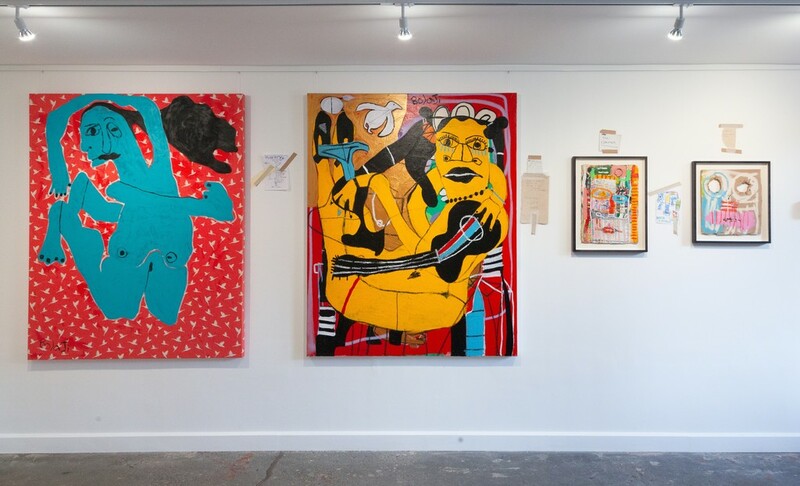 Encompassing a variety of media each piece explores the shared power of ritual and colour to transform our lives as well as support the deepening of our spiritual and emotional connections. 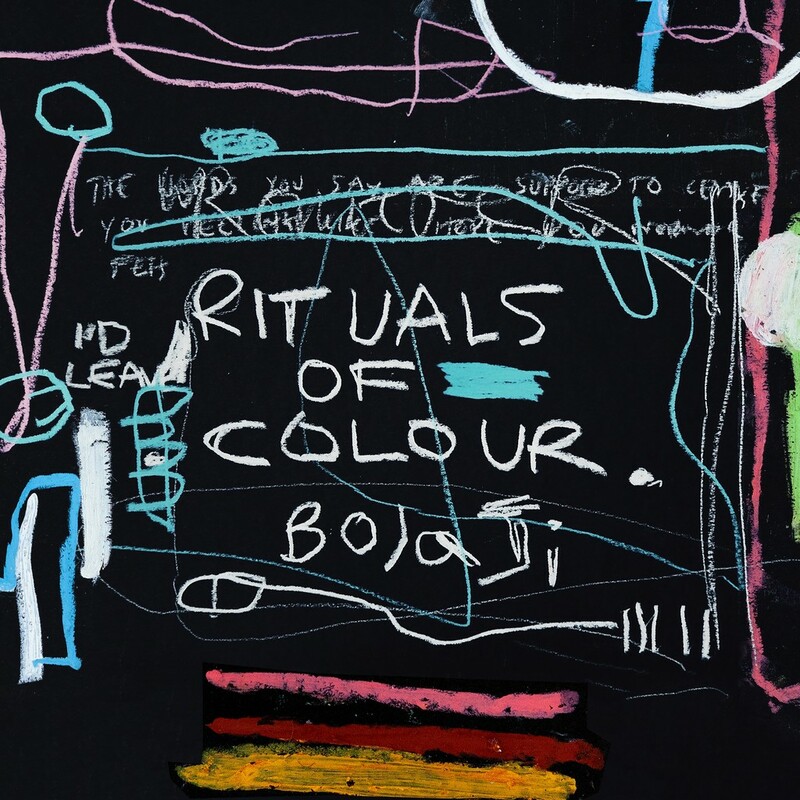 PUBLIC Gallery is excited to present RITUALS OF COLOUR, a solo exhibition of London based artist Adebayo Bolaji. 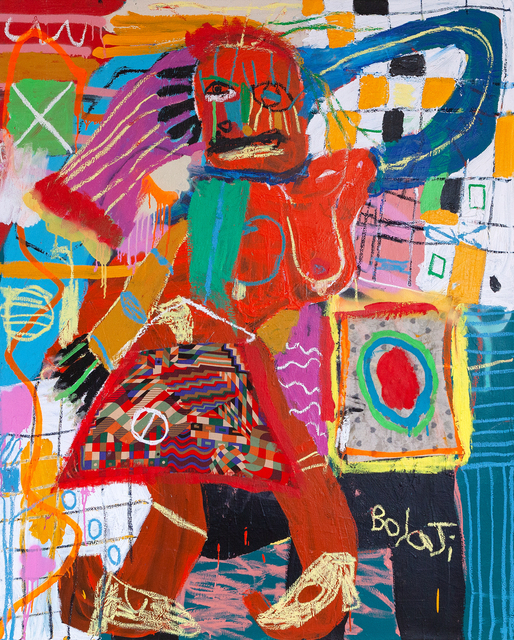 At the centre of Bolaji’s practice is a dialogue between the internal and external world; by responding honestly to the world around him the artist subsequently engages in an intuitive exploration of himself. 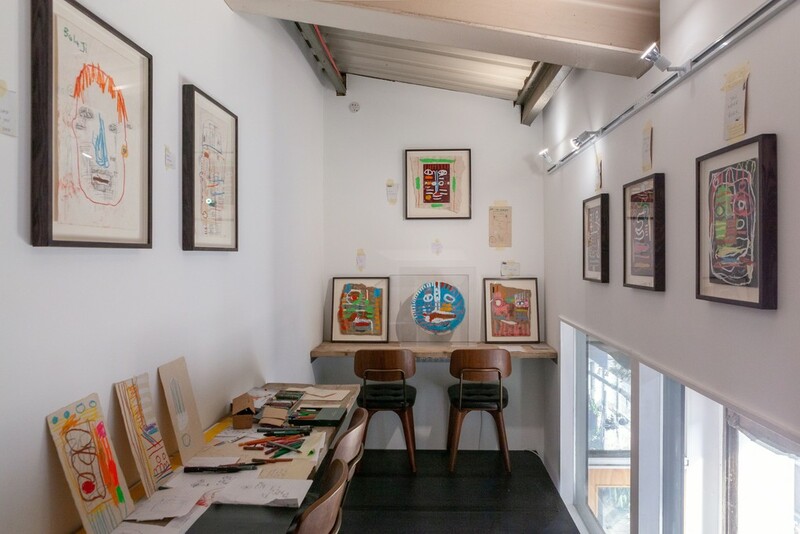 This exhibition presents a series of new work which explore the shared power of ritual and colour to transform our lives as well as support the deepening of our spiritual and emotional connections. RITUALS OF COLOUR showcases a bold new body of work created exclusively for the exhibition encompassing a variety of media to create an immersive experience. 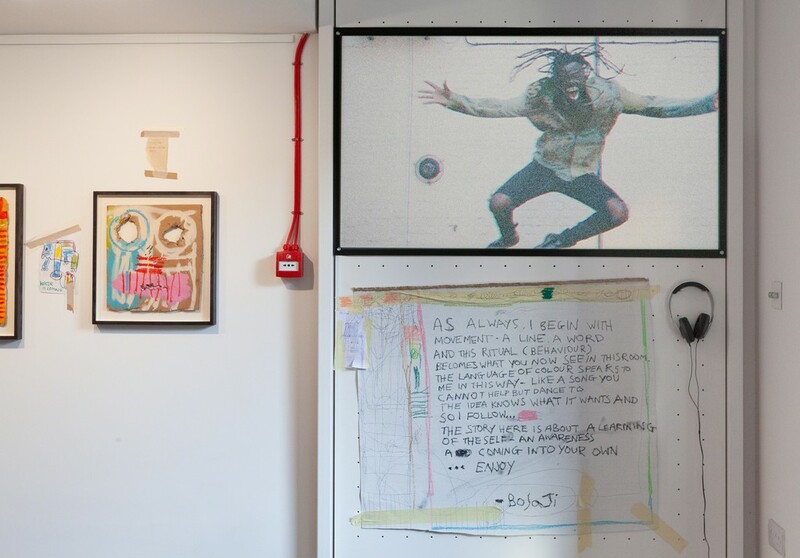 Pasted scraps of Bolaji’s text and drawings will serve as the narrator, guiding the viewer through the space - from a whole wall of the gallery occupied by one of his largest and most ambitious works to date, onto a wall of works on found materials and signature size canvasses. The narration will culminate in a film exploring Bolaji’s thoughts on his own rituals of colour. 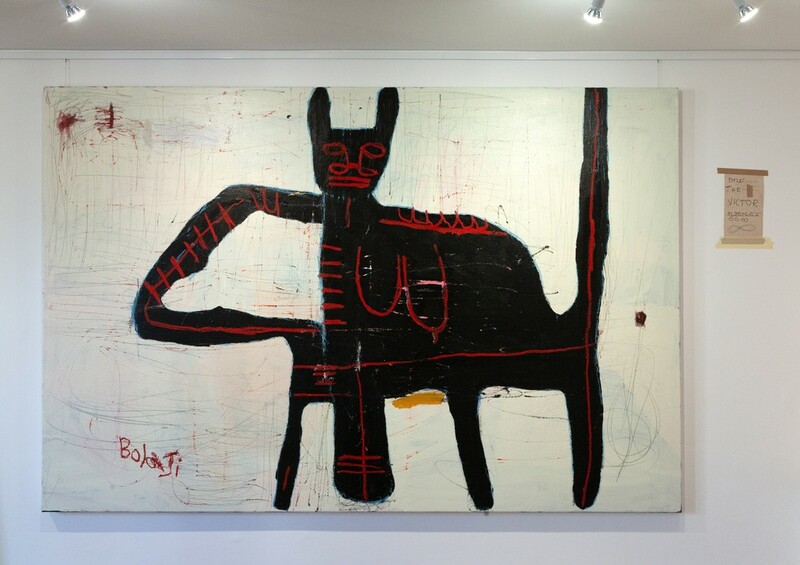 Bolaji describes his style of painting as a form of psychoanalysis. 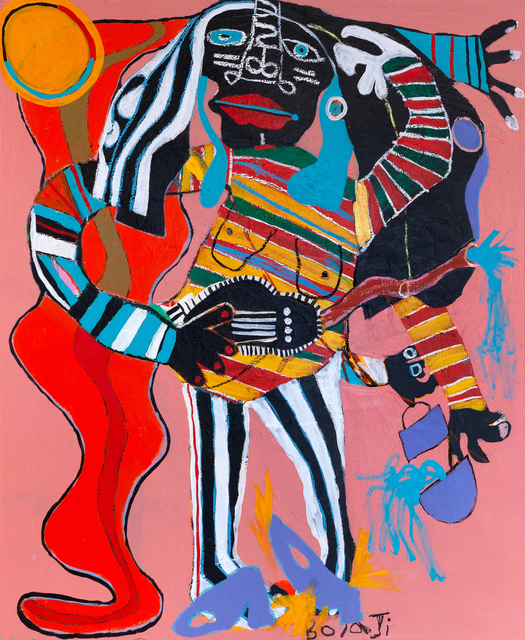 Rich with references to personal history, as well as cultural notes from his Nigerian heritage and home city, London, Bolaji’s colourful and animated canvases unfold organically from within. His process can be characterised as a kind of liberating play in which his emphasis on following and trusting the line as well as his instinctual choice of colour is fundamental. Sigmund Freud cited play as a means of healing: it allows for the expression and reconciliation of unconscious emotions and anxieties. It is an apt metaphor for Bolaji’s paintings, for play transgresses the barrier between the individual’s inner world and the world outside. 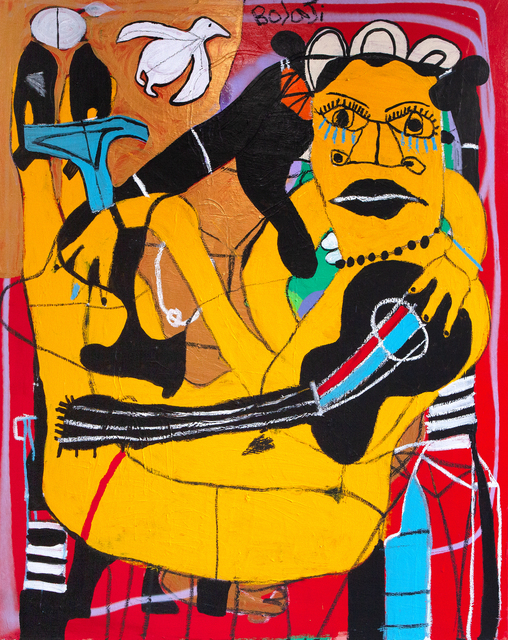 The subject of Bolaji’s work varies, from the seemingly aesthetic to a direct commentary on the state of the human condition. 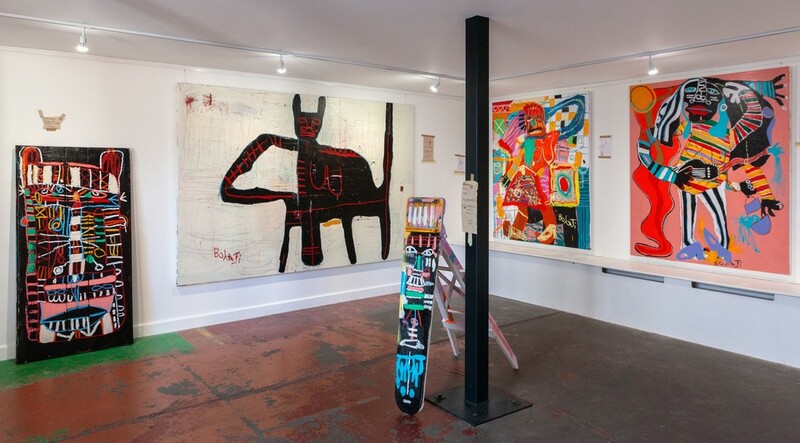 The closer you look at the paintings the more you find to explore; faces loom from dark hidden corners while almost illegible words of poetry appear beneath layers of bold primary colours. 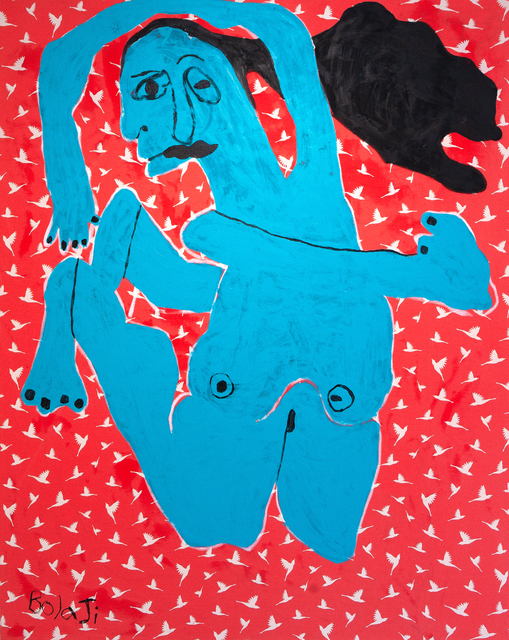 In the current series the artist engages with both ritualistic and mystical imagery; depicting struggles both internal and external between the old and new, these images acting as metaphors for the conflict we all experience whilst establishing our own emotional identities. 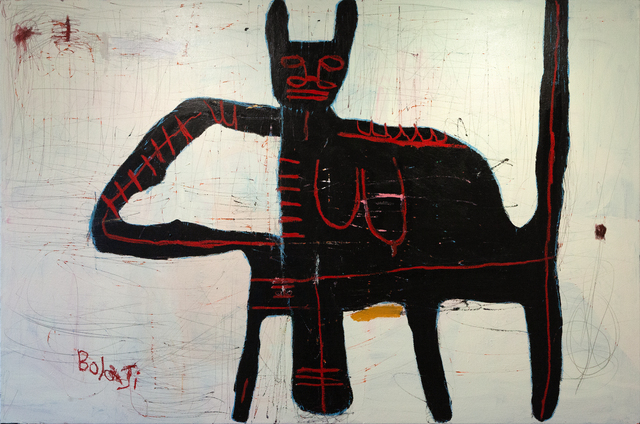 The use of the same vibrant language is a constant element narrating a different story within each painting. Visually, the works have layers of bold colours and as the texture thickens the velocity builds up. Colours are placed on top of each other, without being blended, as they come straight from the tube. The conscious choice of acrylic paint, which dries fast, preserves the energy and tempo of the piece. Through an instinctive process of creation in which colour holds court, Bolaji looks inward in order to comment on the external world. 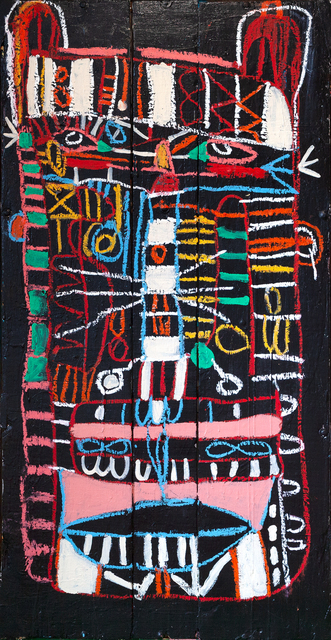 Possessing an almost prophetic quality and mirroring the power of ritual, his cathartic practice provides a therapeutic function for both artist and viewer; on one hand, the viewer explores the painting alone, on the other, there is a strong feeling that you are devouring a part of the artist himself.